The seemingly pristine flows of microscopic nano-bots productively work away towards transforming the natural order of this once corporate landscape into an indeterminable equilibrium of built futures. The immaculate birthing of this built landscape emerges out of the infinitely extended field of towers to have lives that are only temporary, generating a shifting of cultural and economic demands that consequently produce an alternative architectural strategy for the Biomimetic City. 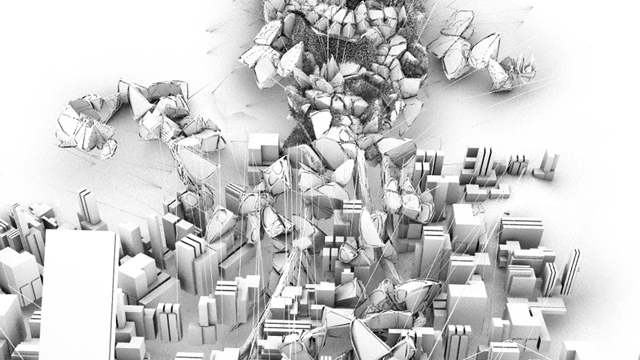 Biomimetic cycles of this dynamic continually reforming city, where decay, growth and reforming are the common state of being, are intrinsic to its continual existence. The structure and function of this biologically rooted system of design, construction and engineering of materials and machines enable new forms and paradigms of nature to emerge. 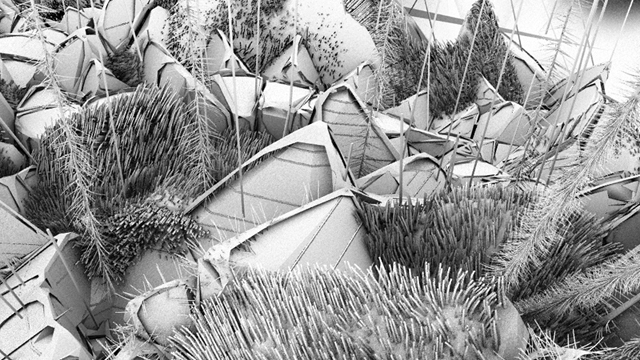 Within the biomimetic city the nano-bots are the catalyst for reordering the urban landscape, and consequently they determine its rate, configuration and materials for growth whilst being simultaneously limited by the current material conditions of its consumption and remaking. The remnant capitalist towers, which were once the symbolic structure for prosperity, are rendered to be irrelevant in the life cycle of this city. In this post-capitalist landscape material structures exist in stasis, in synthesis, and as the biomimetic possibility beyond current futures. The inherent differences of these orders recognisably dissolve over time through the emergence of new relationships, structures and ways of inhabiting the visibly live and normalising the nomadism its population through localised migrational patterns of occupation. The controlled behaviors of such intangible futures produced by Biomimetic Cycles responds to speeds of consumption and waste, calling into question the repopulation of the local in context of the global states of movement. Biomimetic is a meditaor, a producer of the middle ground! The remnant capitalist towers, which were once the symbolic structure for prosperity, are rendered to be irrelevant in the life cycle of this city. In this post-capitalist landscape material structures exist in stasis, in synthesis, and as the biomimetic possibility beyond current futures. The inherent differences of these orders recognisably dissolve over time through the emergence of new relationships, structures and ways of inhabiting the visibly live and normalising the nomadism its population through localised migrational patterns of occupation. The controlled behaviors of such intangible futures produced by Biomimetic Cycles responds to speeds of consumption and waste, calling into question the repopulation of the local in context of the global states of movement. Biomimetic is a meditaor, a producer of the middle ground!